Keter Arc Storage Shed 42 cu. ft. The Keter Arc is characterized by quality engineering, heavy-duty structure and stylish wood-look design. The shed is the perfect storage solution for gardening equipment. It also offers a specialized solution for two 240L/60gal. trash bins, and comes with lid-to-lid chain for hands off opening. Internal dimensions: Width 52 In. This extra-large walk-in storage shed from Leisure Season is elegantly designed and durably built to beautify your outdoor space and keep it orderly. The roomy interior is accessed through two full-height doors and features four adjustable shelves to situate your stored items in tidy fashion. It is solid and sturdy, built with decay-resistant wood harvested from the cypress family that is stained a handsome brown colour and coated with a protective finish to withstand temperature extremes and frequent precipitation. Reclaim your garage! Maybe even park your car in the garage! Bicycles, tools, the lawn mower - they are all organized and accessible thanks to the new SpaceMaker Storage Shed nestled handsomely in your backyard. BEFORE ORDERING, Check with your local building, zoning, and neighbourhood association to obtain all applicable permits. The Palram SkyLight Shed is ideal for storing, organizing and protecting your outdoor life. Palram SkyLight sheds were developed and built to last; they do not fracture, bend or discolour, and withstand extreme weather conditions such as hail and high temperatures. Made with Palram's virtually unbreakable Polycarbonate and reinforced aluminum frame, the SkyLight Shed will provide years of maintenance-free protection. At first you may wonder about the flexibility and thinness of the Polycarbonate panels, but rest assured that once assembled, the shed will be rigid and durable. The unique SkyLight Polycarbonate roof panels transmit natural sunlight throughout the day while having an opaque external visibility for maximum privacy. Front and back vents are included for ample airflow. Designed with your outdoor needs in mind, the SkyLight Shed will compliment your home and enhance your outdoor living space. Arc Storage Shed 42 cu. ft. The Keter Arc is characterized by quality engineering, heavy-duty structure and stylish wood-look design. 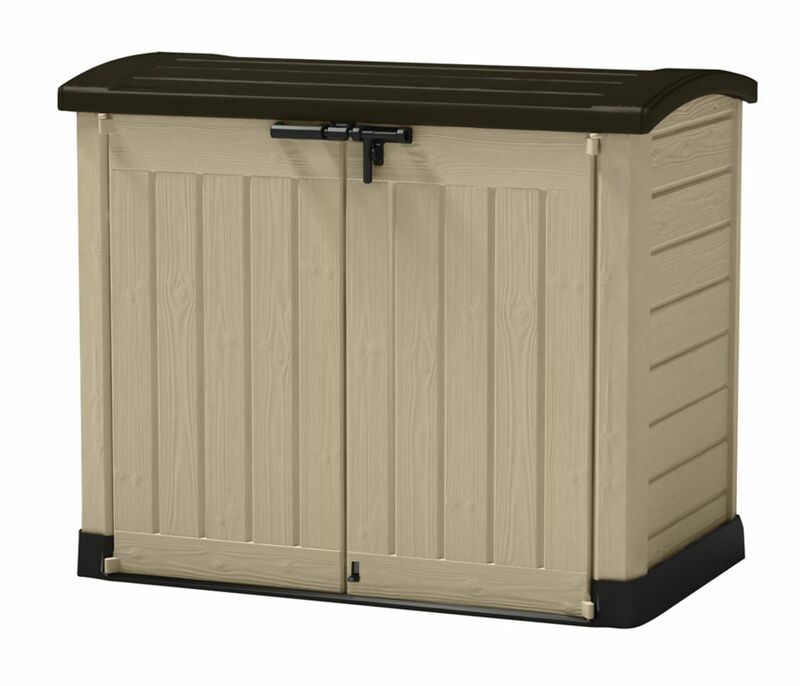 The shed is the perfect storage solution for gardening equipment. It also offers a specialized solution for two 240L/60gal. trash bins, and comes with lid-to-lid chain for hands off opening. Arc Storage Shed 42 cu. ft. is rated 3.5 out of 5 by 21. Rated 5 out of 5 by Elizabeth from Just what we needed. Easy to assemble. It’s in the garage and we use it to store all outdoor patio furniture cushions. Rated 1 out of 5 by sam50 from Nice looking. Very poor quality. I bought this last year (spring 2018) and was patiently waiting before the review to see if it can get any worse. Good part is that assembly was quick and easy. Looks good, too. This is where good things stop. It is not practical. Garbage collection folks are not very gentle and the box cannot survive Canadian temperature changes. First, hinges were slightly off. Strange, but I thought - who cares? Then, cracks started developing and chunks of the box started to fall off the box. Now it stands with door that cannot be closed because the lock at the bottom is broken, hinges are off and holes all around, so impractical to use as refuse box. Honestly, just based on the images I did not expect so poor quality of the assembly. I will attach the images later, so you don't have to believe in my words only. Rated 3 out of 5 by Alex Graham from You will certainly get what you pay for Oh boy, where do I even begin? We had a crackhead steal propane off our patio (big shout out to tent city in Maple Ridge), so I ordered this bad boy after my girlfriend was worried more things would get stolen off our patio. Nothings been stolen, I think they just wanted my propane. I guess their heat is more important than my food, but I digress. Back to this shed- my girlfriend was able to put it together no problem, so that's a real testament to how simple this was to put together; very easy instructions and suited for a beginner. The top plastic lid is warped, so that's a bummer, but it will ultimately be sufficient for what we need the shed for. Rated 1 out of 5 by Floness2011 from Not impressed Purchased this tonstore our garbage. The hinge to open the lid broke within a year. For the price I thought it would have been better quality. Rated 1 out of 5 by Jessica from Regret Buying, poorly made My husband and I were super excited to buy this product to use as a garbage shed and had been looking at it for a year. We finally decided to purchase it and unfortunately it was a huge let down. It didn't even last through 1 storm a door flew off and the shed broke. I had read the manufacturers comments online and it seemed like it was supposed to be durable enough to last through all seasons but it was not. I called the company to see about being sent a new part and the customer service representative was very unhelpful and said that as it was not a manufacturing defect so they would not send a part to replace. In my opinion it is a "manufacturing defect" as it should have lasted through all seasons and didn't last through one! I wasn't going to write this until I had spoken with the company in hopes that they would have great customer service but unfortunately that was a let down as well- so I do not recommend buying this product. I would like to add that I had spoken to Home Depot as well and they were extremely helpful (unfortunately they could not help with replacing the piece- but the customer service was excellent in trying to help me problem solve! So definitely still recommend home depot to purchase your items from! Rated 4 out of 5 by shaki from worth the price Bought this a month back easy to assemble and is working well. Do not know how it will withstand snow in the winter and cold temperatures. Rated 4 out of 5 by Bren from Easy to build, decent quality for the price The shed was pretty easy to put together, it tookr about an hour by myself. The quality is decent for the price. I've seen sturdier sheds but they are $200-$300 more. It gets the job done and keeps my stuff clean and dry. In 2015, I purchased a Jardin Garden Box for the cottage. Unfortunately, the plastic that holds hydraulic arms to cover has broken on both sides. With plastic broken, there is nothing to secure the screws. Is this a design flaw. Is there a fix? Hello Lisa, We do apologize for the problems and inconvenience you had with your Keter purchase. We have customer service available seven days a week 8 am thru 5 pm, EST at 877-638-7056. We can also be reached by email from the following web site: http://uslparts.com/ or https://www.keter.com/en. We can help in resolving any issue to your full satisfaction. Hello Ferris, It will keep contents dry. It is weather resistant, not waterproof. This is UV protected and will not fade. It is constructed from all-weather polypropylene resin plastic that will never chip, rust, rot or peel. Hello getting confused withe actual size that is posted on the web regarding this item.I have a snow blower which i would like to store in this product.The size is 55&quot; long 21 &quot;wide and the height is 35.5&quot; .Will this size fit in the item listed above? Hello Robert111, Here are the internal dimensions for the deck box. 47.6 in. W x 25.2 in. D x 39.4 in. We recommend comparing these to those of the snow blower to be sure. Is this waterproof once closed? Hello Muzzleflash, This is weather resistant and will keep its contents dry and ventilated. Hello Janne, No it is not rodent proof. Can I use this one to store a couple of bikes outdoor during winter? Hello RAAD, Here are the internal dimensions: 47.6 in. W x 25.2 in. D x 39.4 in. H. We recommend comparing these dimension to those of the bikes to be sure.